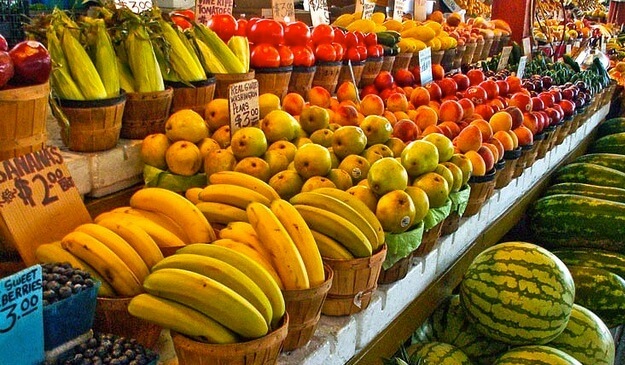 Do you find it hard to eat as many fruits and veggies as you should? Welcome to the club. Many people struggle to incorporate the recommended amount of fruits and vegetables into their diet. It’s understandable – we’re all busy, and that Hot Pocket is just so easy to microwave – but it’s also really unhealthy. Fruits and vegetables contain important vitamins, nutrients, minerals, and fibers that your body needs to function properly. In the interest of upping your intake and lowering the stress associated with it, let’s look at these five easy tips for getting the most out of your diet. 1) Chop and prepare your veggies ahead of time, so they’re ready to use. Preparation might sound like a lot of work, but chopping up a few fresh veggies will help you plan your meal choices all week. After you’ve chopped them up, put the veggies in a zip-lock bag, add two teaspoons of lemon juice, and shake it up! The ascorbic acid in lemon juice will keep it all fresher longer, so you can grab a handful of veggies all week without worrying about them wilting. 2) Add more fruits and veggies to your morning routine. Cut up a banana, toss blueberries or apple slices into a carton of yogurt or oatmeal, and voila! You’ve got a healthy, fruit-packed way to start to your day. More of a veggie person? Throw some spinach, peppers, mushrooms, and onions into your eggs. Incorporate produce into your breakfast routine, and you can get two of your five daily servings of fruit and veggies within an hour of waking up! 3) Maximize your trip to the grocery store. Do not buy prepackaged meals. Just don’t. Instead, opt for your favorite veggies, some meat, and plain potatoes. Need a little spice? Frying potatoes in coconut or olive oil with pepper and onion is still far better for you than French fries. 4) Go to your local farmer’s market this weekend and take some of your spoils to work every day next week. If possible choose fresh, local veggies from your neighborhood farmer’s market. Not sure if your town or city has one? Try searching www.localharvest.org. Once you become accustomed to a higher intake of fruits and veggies, you may find yourself automatically reaching for bell pepper or carrots. Make it even easier on yourself by chopping up your favorite fruits and veggies and bringing them to work every day. At home, you can throw them in a bowl with a little lemon juice for a fresh, easy snack that will stay good all day. 5) Try your best to incorporate fruits and veggies into dinner every night. Once you get started loading up on veggies, it will be increasingly easy to add veggies to various meals (especially if you do step 1!). Try cooking a fajita dish with peppers and onions, or add some peas to your rice. You could drizzle a light vinaigrette on spinach for a simple salad, or add mushrooms, bell peppers, snap peas, and chicken for a fancier dinner option! The choices are endless when you learn to love veggies. Working them into your diet is easier than you think, and once you start, you’ll experience a range of benefits. Chief among them? Your skin will improve, you’ll feel fitter, your energy levels will rise, and your food bills will drop — a win for you and your wallet!